In this work by Marjan Beuker we see a display with two model railway figurines. 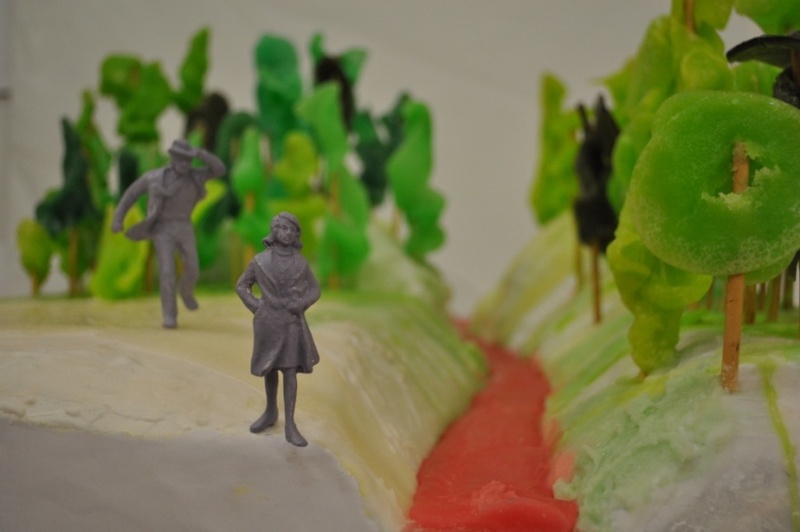 The landscape consists of a papier-mâché terrain with trees made of green sugar confectionery on pretzels trunks. A pink icing river runs through the park-like countryside. 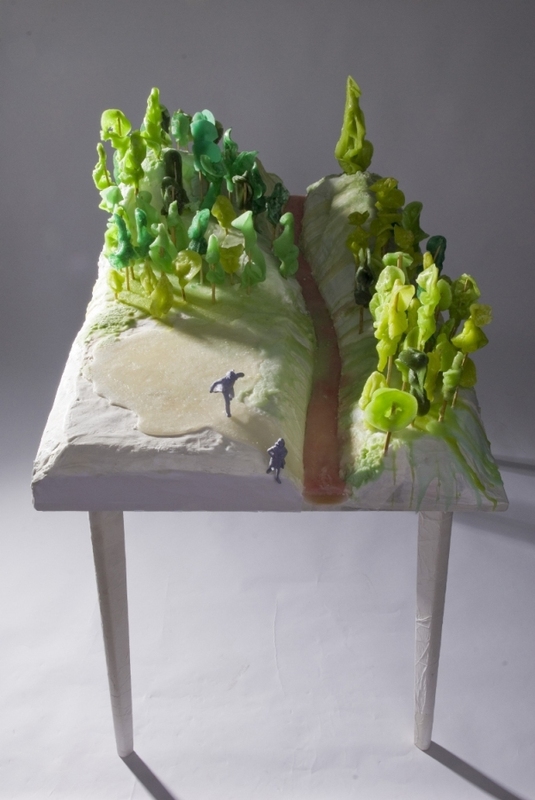 The maquette is 47 x 27.5 x 35.5", giving us an accessible view of the whole situation. Sugar trees fill the entire right bank. On the left bank the lollipop forest only forms the backdrop, while in the foreground we have a scene frozen in time. Closest to us is a female figure. Clad in a raincoat, with her purse clutched to her side, this woman is about to step off the edge. Behind her, we see the figure of a man caught in the action of running. His open jacket is flapping, his tie is swept up, and with his right hand he holds his hat on his head to prevent it from flying off. The little models are unpainted, unchanged from their originally cast mode. They present themselves in gray, as if this scene is a still of a black-and-white movie in the otherwise colorful surroundings. Although the two people are rigid and monochrome, we can sense the emotion from their postures: the man is running frantically, the woman is on her way with determination. How do we interpret this scene? Is the woman in this situation the original Eve, or does she stand for all women? Let's see where it takes us if we choose the first option. Adam and Eve were expelled from Paradise after they had eaten of the forbidden fruit. Paradise had been a ‘sweet’ deal: a beautiful garden, interesting animals to play with, plenty of vegetables and fruits without labor, and the pleasant company of God and each other. All of that changed. In art the Expulsion is portrayed with the couple naked, sometimes desperate and crying (Masaccio), sometimes remorseful and pleading (Natoire), sometimes defiant (Adam) and apologetic (Eve) (Cesari). Here, Eve with all her cultural trappings -clothes and purse- leaves Paradise with a purpose. Maybe she has had enough of the accusations. Maybe she has come to terms with the crime and punishment, and now just wants to move on. Where Eve is, there is also Adam. But why is he running after her? Does he need her forgiveness? "Wait Eve, I didn't mean it that way. Can we please start over again?" Or does he want her companionship? "Eve, wait up! I am nothing without you!" Maybe he wants to protect her. "Don't go there, Eve! I know a better way!" If it was Eve who first fell for the snake’s deception, here it is also Eve who takes the first steps to make something of herself in a fallen world. Ironically, in two of the three paintings mentioned above, Eve is slightly ahead of Adam as they leave Paradise. If, however, this Eve represents all women, then why is she leaving and where is she going? Is the sugar paradise no longer sweet but cloying? Did the place that was meant to be ideal for Eve turn out to be someone else's ideal for her? Maybe she rejects the society which only offers empty calories of entertainment and virtual reality as she is looking for substance and authenticity. Finally, she has the courage to leave. There are rivers to cross and mountains to scale, but at least it is her own journey. Is the running man chasing her, trying to keep her from leaving? Or is this a helpful male figure - a father, brother, or good friend - who will give her a little money and maybe an address where she can go? And then again, maybe the man wants to accompany the woman on her journey. After this woman has made up her mind about the need for change, the man realizes what he will lose if she goes. Hindrance, help or hope? Eve and Adam had to leave Paradise, but God did not leave them. He went with them through all their travails. Likewise, when the woman steps out of the sugar paradise, God will not leave her, but will lead her on into the future. Marjan Beuker: Eve Steps out of the Sugar Paradise, 120 x 70 x 90 cm/47"x27.5"x35.5", sugar, rice paper, model railway figures and table, 2010. For more information (in Dutch): www.marjanbeuker.nl; www.bik.marjanbeuker.nl; www.jubileecampaign.nl.